Fall nights get chilly so keep you and your guests feeling cozy with warm lighting, bring the outdoors inside with candles and tinted lights. Want to try something different? A Polaroid guestbook is a fun DIY idea that your guests can have fun with all night long! Shake your booty like a Polaroid picture! Nothing say’s fall like pumpkins! For a fun touch you can cover them in paint or glitter for a nice decoration on your gift table or you can make them part of your center pieces for each table. Without a doubt the outdoors are beautiful in fall! 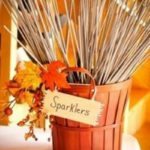 Embrace this magical season with a sparkler send off or even an outdoor photo booth with seasonal props. Calling all grooms! You can rock the seasonal colors with a bold boutonniere- try something different than the traditional flower, maybe a few autumn leaves with a vibrant ribbon. Embrace your rustic chic side with the prefect DIY centerpieces that tie autumn and glam into one. Caramel apples with a chocolate coating are a fun wedding favor that incorporates autumn into your wedding. There are so many creative ideas for fall drinks- try a salted caramel apple martini or even a sparkling apple pie cocktail. Capture every moment because these are the memories you will remember for the rest of your life.